Scrumptious chimichurri cilantro sauce made with fresh parsley. Blended with garlic, olive oil, and apple cider vinegar. Delicious on beef, fish, and chicken. It is gluten-free, paleo, and vegan! Savory Thoughts: The dynamic change. If you have never made this sauce, you are in for an EPIC change with your taste buds. This herbal sauce is filled with bold flavors from the garlic, apple cider, peppers, and cilantro. This sauce is pretty much another version of pesto. So if you love pesto, then you’ll love this Chimichurri cilantro recipe! 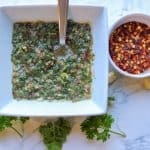 Why this chimichurri cilantro recipe works? As I said, it pairs well with beef, chicken, fish, plantains. Furthermore, steak, it’s a great dressing or marinade and it goes perfectly well with rice. I mean the list goes on. And it is prepared in just 5 minutes or less!!!!!! I made this sauce last weekend to serve it with the fried plantains for our family dinner. My father in law who is an avid Haitian food lover went crazy for it and even asked me for the recipe. He was blown away by the flavor! When he first looked at the sauce he exactly question was “what’s this”, I replied and said “it’s chimichurri”, then, of course, he said “quoi?” (meaning what? in French). I just laugh and said “don’t worry, have it with your bannan (fried plantain) and you’ll love it! Needless to say, I WAS RIGHT. When I gave him the chimichurri sauce to accompany his fried plantain, the first thing he did was smiled. Immediately I knew he was enjoying it. He ate everything! He asked for seconds! YOU MUST TRY THIS RECIPE at your next gathering or with your family. Heck, try it for yourself. No need to wait to be accompanied by guests or the family to enjoy a nice dish or side. It pairs well with so many great dishes. 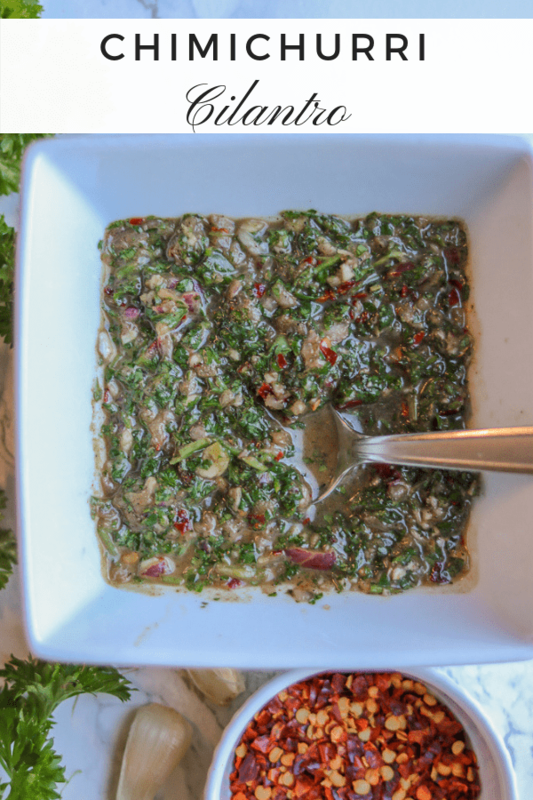 If you made my pikliz recipe, which I recommend you do if you have not tried it because it’s pretty darn delicious as well, you’ll enjoy this chimichurri cilantro sauce too. 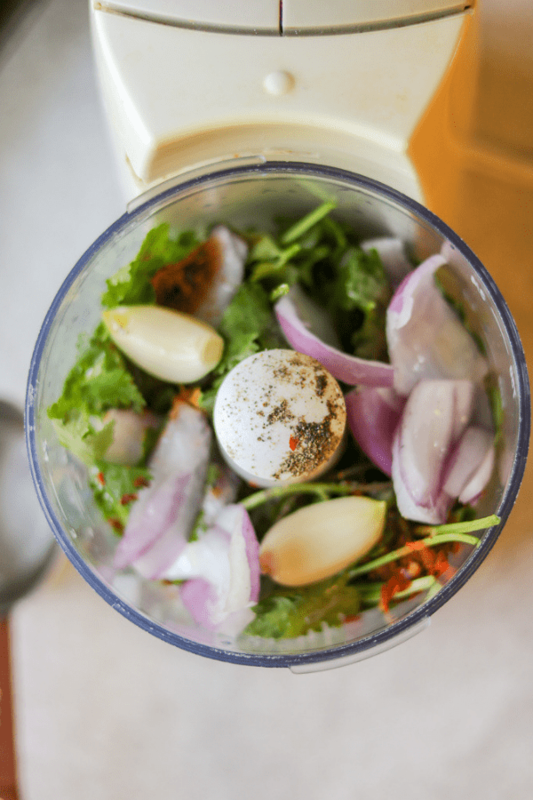 How do you make the BEST Chimichurri Cilantro? The method is simple. Combine all of the ingredients: fresh cilantro, fresh parsley, garlic, olive oil, apple cider vinegar, paprika, and red pepper flakes. Then blend away. Pour the mixture in a bowl, and serve with your favorite side dish or meat and enjoy! 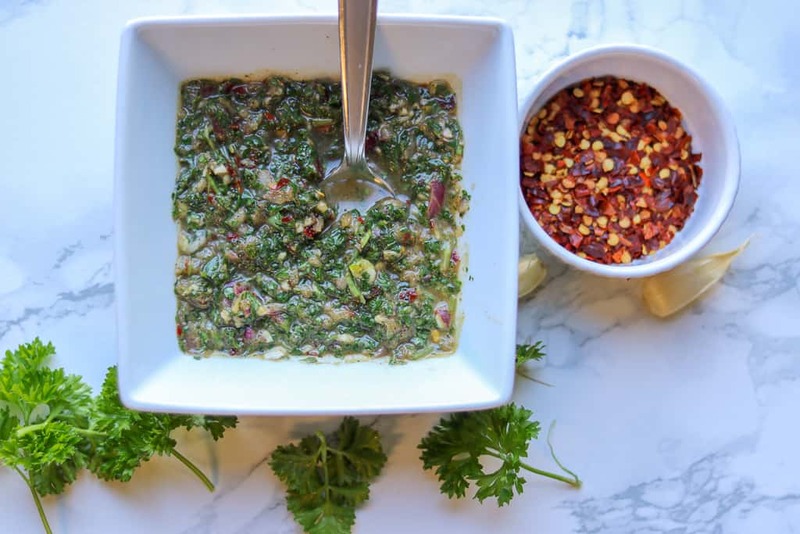 Did you make this Chimichurri Cilantro Recipe? Tag me on Instagram or Facebook so I can share your picture. I’d also appreciate if you would please give it a star rating below! 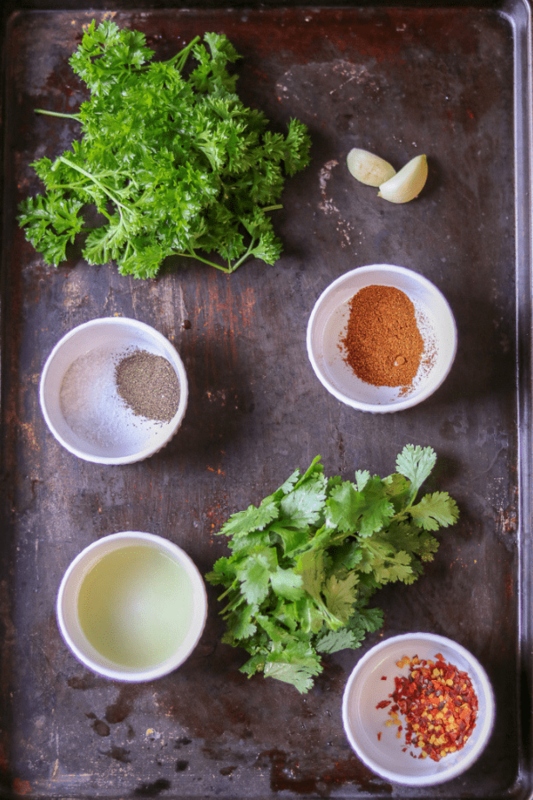 SAVE THIS CHIMICHURRI CILANTRO RECIPE TO YOUR PINTEREST BOARDS! ALSO, I AM ALWAYS PINNING TASTY RECIPES, LET’S CONNECT ON PINTEREST! Scrumptious chimichurri cilantro made with fresh parsley. Blended with garlic, olive oil, and apple cider vinegar. Delicious on beef, fish, and chicken. It is gluten-free, paleo, and vegan! If you have never made this sauce, you are in for an EPIC change with your taste buds. This herbal sauce is filled with bold flavors. Place all of the ingredients in a food processor and blend. Pour the mixture in a bowl, and serve with your favorite side dish or meat and enjoy! Keep refrigerated for up to 5 days in an airtight container. Welcome to my site and my kitchen! I am a follower of Christ and recipe developer. Search a delicious recipe here! Want to work or collaborate with me?